From the public’s perspective, Rolex’s surge into its movement revolution began with the now anachronistic-sounding Basel 2000 World Watch, Clock, and Jewelry Show. But the evidence of a long-term engineering campaign was mounting at the patent office and in the dealers’ showrooms. Consider the 2005 Cellini Prince, highlighted previously in The Golden Age Of Rolex Movements Part I: Sowing The Seeds Of Greatness. Rolex made the Cellini Prince an early recipient of the Paraflex shock system, a tangible sign of Rolex’s progress internalizing the movement production of all components. Achieving proprietary shock protection is an extraordinary feat; only massive firms such as the Swatch Group and Seiko Epson or single-purpose suppliers such as KIF Parechoc produce these subassemblies. Meanwhile, at the patent office . . . Components such as shock springs are as significant to the Rolex watchmaking revolution as the rock-star movements themselves. And Rolex often telegraphs its next moves – and movements – with patent applications. Just like that, Rolex dropped the Parachrom alloy for its future nonmagnetic hairsprings. U.S. patent number 6329066 requested in March 2000 specified “a self-compensating spring for a balance-wheel oscillator . . . and process for treating this spiral . . . the oxide layer which forms has a thickness of the order of 50 nm, giving the spiral a blue color.” As in this fashion, the current Parachrom Blue hairspring was born. Look back even farther, and one begins to grasp just how long certain ideas gestate inside the Rolex fortress. In January of 1989, Rolex filed for U.S. patent number 4866684 to protect its concept of a “Chronometer for starting races, particularly regattas.” Details of the application text include mention of a dedicated ten-minute countdown scale. Granted, this project also included mention of an electronic drive system, but the bug had been planted: Rolex was thinking about a dedicated regatta chronograph three years before the first time-only Yacht-Master broke at the 1992 Basel Fair. Look back even farther, and it becomes evident that Rolex prototyped a Yacht-Master chronograph during the late 1960s. 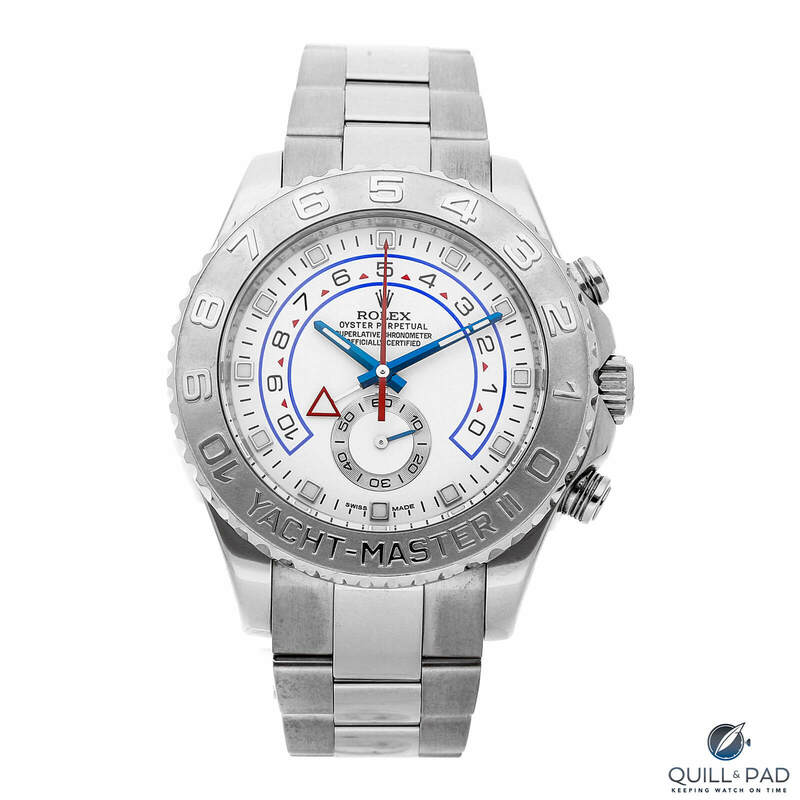 Baselworld 2007 witnessed the end of this extraordinary incubation cycle in the form of the Yacht-Master II. At the time, the watch was the most complex Rolex product ever sold. Caliber 4160 comes on strong: the Daytona’s 70-hour reserve, ball-bearing rotor, vertical clutch, column wheel, and robust architecture carry over from the 4130 movement. To this functional core, Rolex added a programmable countdown system with a memory capability that resets to its specified interval without fail until reprogrammed. The Yacht-Master II is designed to act as a flyback and fly-forward chronograph to center on the nearest minute when actuated. Finally, all programming is performed with a “Ring Command” bezel that doubles as part of the movement itself. For the first time, Rolex began to offer public insights into advanced industrial procedures used in the fabrication of its movements. Contemporary press dispatches from Geneva boasted of employing the micro-manufacturing technique “Lithographie, Galvanoformung, Abformung” – better known as LIGA profiling, which sees nickel-phosphorus components “grown” on a substrate for perfect geometry – for the most sensitive and tolerance-intensive mechanical components. Considering how niche the regatta timer function was in 2007 and remains today, the level of engineering investment was stunning. But the new movement wasn’t perfect. Caliber 4130 was more sensitive to maintenance intervals and more susceptible to rough handling than previous Rolex movements. 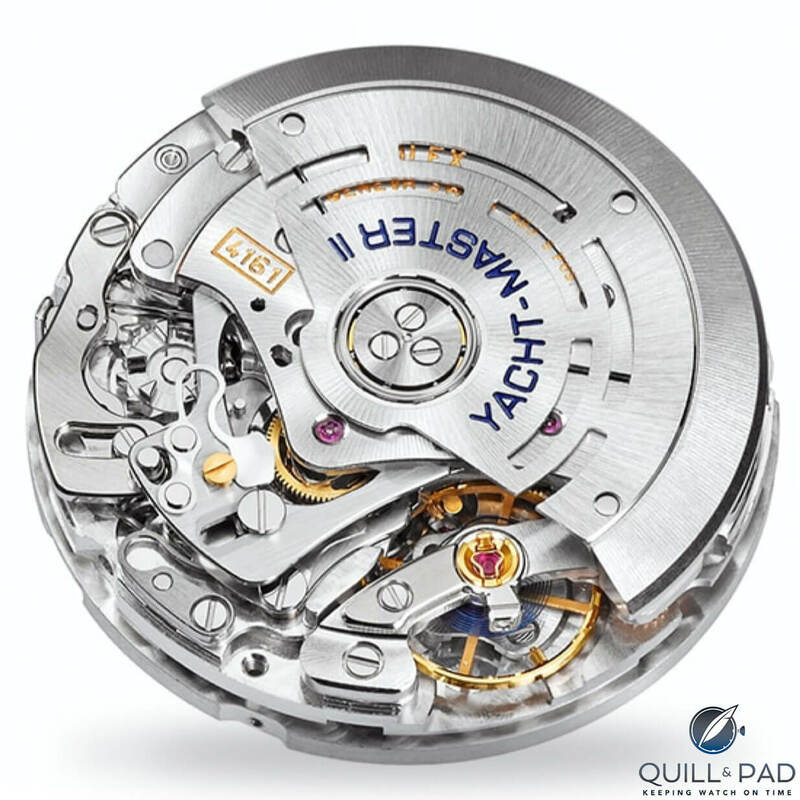 Reset action and the flyback/fly-forward function often developed lag or stalled entirely, and given the quantum leap of complexity for Rolex calibers this wasn’t shocking. A reboot of sorts occurred in 2013 with the arrival of the long-awaited stainless steel Yacht-Master II. The undercard of this marquee launch was the revised Caliber 4161. More robust and more consistent, the 4161 brought the Yacht-Master II on par with the Daytona’s reliability and crisp pusher feel. But 2013’s detail revisions to Caliber 4161 barely registered amid the aftershocks of Rolex’s 2012 engineering quantum leap, the Sky-Dweller annual calendar GMT. Even with eight years’ worth of hindsight, the Sky-Dweller remains perhaps the least expected and most ambitious Rolex engineering project of the twenty-first century. While stunning, the arrival of the Sky-Dweller could have been anticipated via diligent reading of Rolex’s U.S. patent applications. As far back as 2003, U.S. patent number 6744696 described an annual calendar system based solely on wheels and pared down to the minimum necessary parts count. The elegant system was described as a solution for a “clock,” but a quick review of Rolex’s sparse modern clock portfolio suggests that this was little more than a smokescreen. Another piece of the Rolex roadmap appeared in June 2011, less than a year before the launch of the Sky-Dweller, when Rolex filed U.S. patent number 8328414 for a bezel-based function selector by which “the function and/or indication which is to be adjusted is selected using a rotating bezel. Because of this the number of functions and/or indications which are to be adjusted can be high, as the bezel can rotate through 360 degrees. In hindsight, Rolex was trying to protect itself ahead of a major product launch, but rarely have Rolex patents so explicitly and thoroughly previewed the consumer product to follow. And what a product. The Sky-Dweller’s Caliber 9001 is a monster comprising the most individual parts of any Rolex movement past or present. With 380 components, the 9001 narrowly eclipses the regatta chronograph, and the simplicity of the Ring Command bezel interface cloaks the fearsome mass of moving parts within; the bezel system alone accounts for 60 parts. Perhaps chastened by growing pains with the Caliber 4160 regatta timer, Rolex seems to have taken great pains to ensure the mammoth Caliber 9001 lived up to Rolex levels of toughness. The Rolex annual calendar system, dubbed “Saros” after celestial phenomena, can be set bidirectionally without damaging the movement. As with the Ludwig Oechslin annual calendars designed for the MIH watch, Zenith and Ochs und Junior, the Rolex system is designed and constructed with usability and reliability in mind. 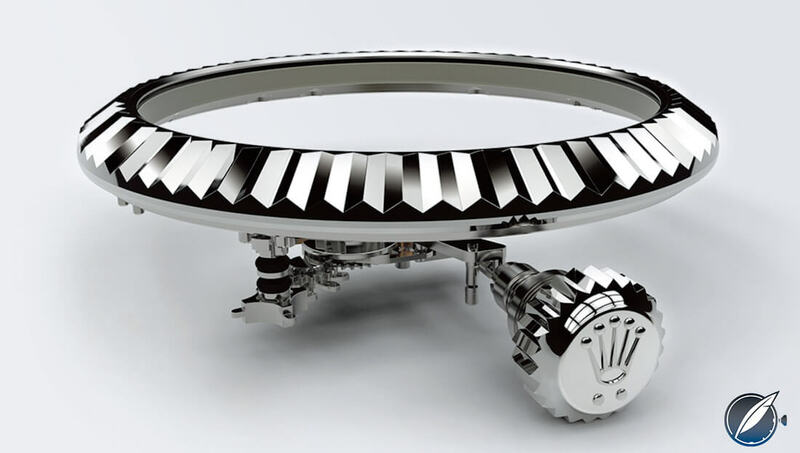 Peripheral features include a 70-hour power reserve, winding-rotor bearings, a niobium-zirconium oxidized non-magnetic hairspring, and a free-sprung balance with a full bridge. To put the complexity of Rolex Caliber 9001 in perspective, consider that Audemars Piguet’s modular chronograph in the Royal Oak Offshore (3126/3840) includes 365 parts and the Patek Philippe 5370P’s split-second chronograph Caliber CH29-535PS includes 312 parts, both exceptional haute horlogerie movements. 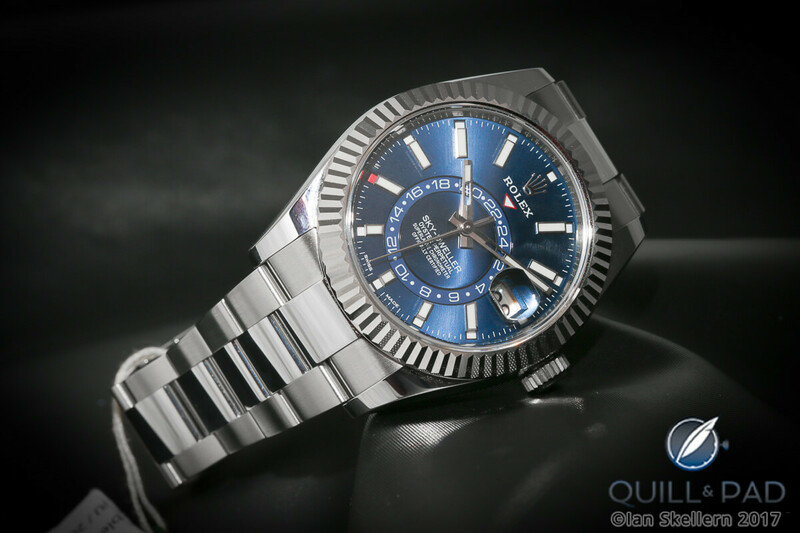 Moreover, Rolex democratized the Sky-Dweller in 2017 with a – mostly – stainless steel model priced at less than one-third of the original $48,850. For those who love movements but are reluctant to pay a precious-metal premium, Rolex prices the $14,400 Sky-Dweller 326334 within shouting distance of the $12,400 Daytona. Although new models steal headlines, and no watch brand self-promotes with the gusto and grandeur of Rolex, the segment juggernaut tends to steer buyer attention away from movement engineering. Despite the arrival of two monstrous complications in the space of five years, Rolex refused to redefine itself as a company or a brand. Ongoing innovations occurred as a sub-text to celebrity ambassadors, event sponsorship, and mainstream media campaigns. The tension between Rolex’s movement innovations and branding exercises contribute, in part, to blame for watch collectors’ tendency to overlook Rolex watchmaking. Part III of this series will explore the primacy of branding at Rolex and its impact on the company’s public reputation for movement innovation. For more information, please visit www.rolex.com/watches/yacht-master and/or www.rolex.com/watches/sky-dweller. Oh, and to anyone who wants to buy a steel Sky-Dweller at retail price – the best of luck, may the force be with you, etc. Hi Gil, thank you for reading my article and taking the time to offer this kind feedback. I’m going to get slightly sycophantic here, but it was your review videos that made me absolutely sure I wanted to get a new Overseas and a Breguet 5157. And I think…I think these articles are starting to revive a desire to have a Rolex in my collection. Thank you for following me across multiple media, Gil! I appreciate that you took the time to read and offer this feedback. Which Rolex candidates do you have in mind for you collection? let me guess, this is your favorite watch brand? Hi Dan, thanks for reading. I can’t speak for the assembled, but Rolex is a brand that I respect rather than love outright. The idea behind this article series was to take a counterintuitive look at Rolex as an engineering house rather than its usual portrayal as a designer name. Parts 2 and 3 of the series will dig deeply into patents for Rolex watches in production and technologies for watches not yet extant. It’s happy movement for me to join with Rolex company.